The Amazon Room had a different feel than usual at the start of Day 7 of the 2012 World Series of Poker Main Event. Unlike past years, the final 27 was devoid of a well-known high-stakes superstar that would capture the lure of the casual poker fan. No Phil Ivey. No Michael Mizrachi. No Ben Lamb. Still, there was one key storyline grabbing the attention of the poker world. Elisabeth Hille and Gaëlle Baumann were still alive, and each were looking to become the first woman to reach the Main Event final table since 1995. Barbara Enright was the last to do it, taking fifth place that year for $114,180. Enright now has a seat in the prestigious Poker Hall of Fame. Every year since '95, the world has watched the Main Event's "Last Woman Standing" fall short of history. We've seen names like Annie Duke, Maria Ho, Tiffany Michelle, Breeze Zuckerman, Erika Moutinho, Tiffany Williamson, Sabyl Cohen and Leo Margets come painfully close. Duke was the closest, finishing in 10th place in 2000 — while she was eight months pregnant. That same year, Kathy Liebert took 17th. 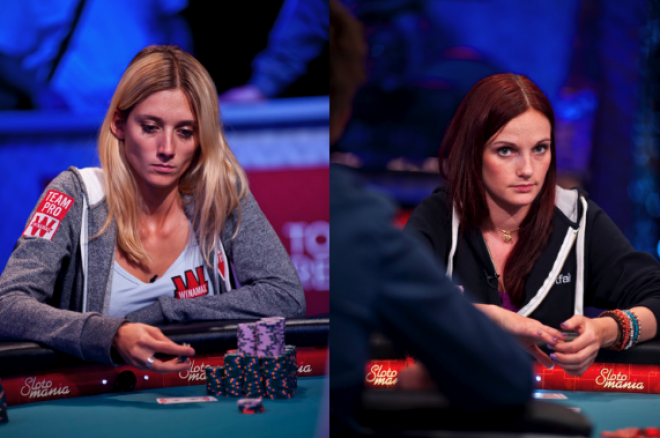 It was the last time two women made the final two tables of the Main Event. This year, it was Hille, a soft-spoken waitress from Norway, and Baumann, a poker pro from France. The two women took completely different paths to reach Day 7, but together they created the most remarkable story leading up to the Main Event final table. The "Last Woman Standing" title was also still up for grabs, but that honor didn't seem to matter to either. Both had their sights set on the final nine. And Hille said she was even pulling for Baumann to get there with her. "I think it would be awesome to have two women going really deep into it and I actually think it's much cooler to have two women on the final table," Hille told PokerNews' Kristy Arnett late on Day 6. "I wish [Gaëlle] the best." With 11 players remaining and both women still in the tournament, the odds favored at least one of them reaching the final table. But incredibly, Hille and Baumann landed directly on the bubble, creating an all-male final table for the 17th straight year. 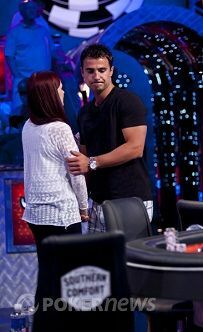 Hille began Day 7 fifth in chips with 9,770,000 after a productive Day 6 during which she rocketed up the leader board. The self-proclaimed amateur displayed her poker chops numerous times, particularly against eventual champion Greg Merson, who had a difficult time with Hille at the ESPN Feature Table. But the penultimate day proved to be a disastrous one for Hille. Her stack slowly dwindled throughout the day, and with 13 players remaining she even doubled up Baumann when her failed to come from behind against Gaëlle's . That left Hille among the short stacks with 7,500,000. After the field trimmed down to 11, she met her demise against the man who would later be known as the lady killer: Hungarian pro Andras Koroknai. With the blinds at 150,000/300,000 and a 40,000 ante, Koroknai raised to 605,000 from the cutoff and Hille three-bet shoved for 3,465,000 from the button. Action folded back to Koroknai, who called, and Hille's tournament life was at risk. As reported by our live reporting team, the Norwegians and the Hungarians in attendance jumped to their feet when Koroknai called, and the final table arena grew quiet as the flop fell . It was no help for Hille. The turn was the , giving Hille extra outs to make a straight. But the completed the board, and Hille accepted her fate while Koroknai's rail exploded. Once the cheering died down, Hille was given a standing ovation as she exited through the tunnel. Poker immortality was left in the hands of Baumann. Following Hille's exit, all eyes shifted to Baumann as she made her way to the "unofficial" final table of 10. Baumann was the shortest stack, holding just six big blinds, but she managed to double up on Hand #11 against Merson. After Steve Gee raised to 700,000 from the button, Merson three-bet to 1,800,000 from the small blind. Baumann then called all in for 1,780,000 from the big blind, and Gee quickly folded. Merson turned over and Baumann tabled a monster: . The flop came , and the raucous crowed reacted to the sight of the jack. The turn then brought the , and Baumann's rail cried, "Deuce! Deuce!" Their prayers were answered when the dealer tabled the , and Baumann had survived. The French pro was safe for the time being, but she was still the short stack and knew she had to make some moves to stay afloat. After her shove on Hand #14 went uncalled, she tried again on Hand #15. This time, though, Koroknai played executioner. Baumann moved all in for 5,200,000 from the hijack seat with the , and Koroknai called from the small blind with the . Once again, Baumann was at risk, but this time she was in grave shape. Chants of "Nine! Nine! Nine!" filled the Amazon Room before the flop fell . Baumann could now chop with a three or any running pair cards. The crowd erupted at the sight of the on the turn, even though it didn't pair Baumann. The last woman standing could only be saved by a nine for the win, or a three or an eight for a chop. The completed the board, and while those who made the official final table celebrated, the poker community collectively fell silent as hopes for a female at the final table were once again dashed. Making the elimination even more painful for Baumann was the cruel memory of a hand she played against Koroknai on Day 5 — one that could have eliminated the Hungarian. After Baumann raised to 60,000 in middle position, Koroknai moved all in for around 2,000,000 from the small blind. Gavin Smith folded from the big blind, and Koroknai mucked his hand without realizing that action was back on Baumann. Koroknai's tournament life was now in the hands of the tournament staff, which decided that, to preserve the integrity of the tournament, Koroknai would simply forfeit 60,000 chips to Baumann and keep the remainder of his stack. An irritated Baumann showed two kings; Koroknai later said he had . Many players felt that Koroknai's blunder should have eliminated him from the tournament, thereby adding his chips to Baumann's stack. Would those extra chips have helped Baumann reach the final table? Who's to know? But once again, we were left waiting another year for a woman to burst through that vaunted WSOP Main Event bubble.